In the 1976, Marvel Comics had the rights to bring Patrick McGoohan’s The Prisoner to comic book form, initially with Jack Kirby and then later with Steve Englehart and Gil Kane on board but for various reasons, neither story (each an adaptation of the series’ premiere episode ‘The Arrival’) was never published. 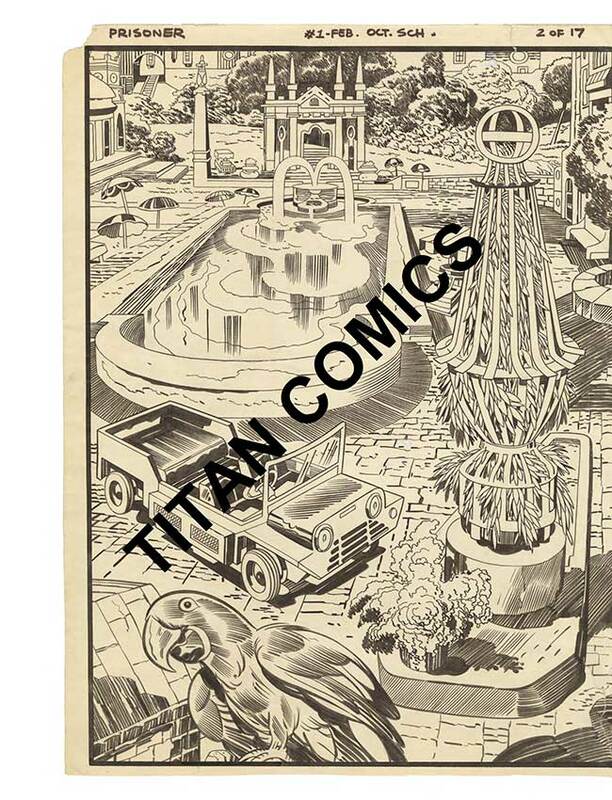 Forty-two-years later, Titan Comics corrects that, publishing all of the existing material created for the project for the first time ever in a hardcover edition that includes a wealth of extra content. Jack Kirby wrote and illustrated this first story, with inks by Mike Royer. Adapted from the script for the first episode, it follows McGoohan’s character immediately after he arrives in The Village. Unsure where he is or how he got there, he wanders around for a bit, eventually talking up a waitress at a café who is clearly being evasive, not wanting to answer his questions. From there, we flash back to London, the night of his resignation when he was gassed and smuggled out of his flat under cover of a mock funeral. Back in the present, he’s picked up by a beautiful woman in a car who, again, evades his questions. After basically being driven in a circle he hears the loudspeakers set up about town encouraging the residents to get outside and take advantage of the beautiful weather. He winds up at the house assigned to him where he hears the phone ring. He answers and is instructed to meet the caller for breakfast, an invitation he figures will lead to some answers but when he opens the door to Georgian House, he learns that those who have brought him here have done so due to his retirement – the information in his head is priceless, and they want it. Kirby’s art style is perfect for this, he really nails McGoohan’s likeness but then McGoohan almost looked like a Kirby creation in his own way. The layouts are fantastic, there’s plenty of his trademark ‘sci fi gear’ on display in the backgrounds of various panels and there’s a very cinematic feel to all of this that suits the story and the whole vibe of the TV series that inspired it quite nicely. It’s a treat to see this after knowing of its existence for decades, even if it is in an unfinished form. The flip side of that coin? 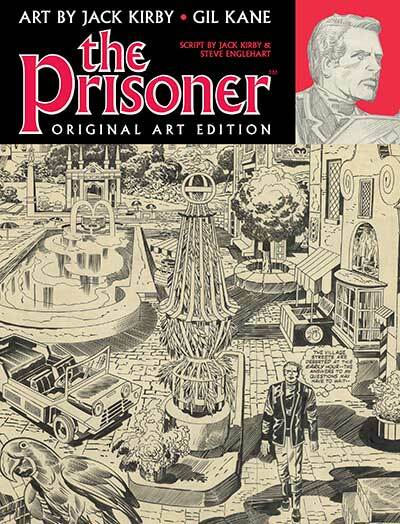 It kind of stings knowing now how much potential an ongoing Kirby/The Prisoner series had and that we’ll never get to have more of it than what we have in this book. Written by Steven Englehart and illustrated by Gil Kane, this take on the series’ first episode plays very much like Kirby’s, which makes sense given that they’re both inspired by the same shooting script. Presented here without lettering or text, it shows The Prisoner being gassed and waking up in The Village, talking to the woman at the café, taking a ride with the taxi driver and then eventually meeting those who run things from behind the scenes for breakfast. Kane’s art style is very different than Kirby’s but no less impressive. It might not go as over the top with some of the visuals as the earlier take did but there are some equally impressive layouts here, lots of great ‘camera angles’ used to bring you into the story. The pencils are tight and the characters well-drawn. Again, as it is with Kirby’s take on the material, Englehart and Kane’s work leaves us wishing that there were more of this material out there to enjoy. It’s very well done and definitely in keeping with the spirit of the TV show. DC would prove with Dean Motter and Mark Askwith’s The Prisoner: Shattered Visage mini-series, and then Titan themselves with their 2018 run from Peter Milligan and Colin Lorimer’s take on the series, that The Prisoner is a very viable comic book property – it’s just a shame that Marvel didn’t see it that way back in the seventies. In addition to the two stories collected in this book, we also get a forward penned by Mike Royer (who inked and lettered Kirby’s story) that gives us some quick background information on Patrick McGoohan and how he personally met him while working on the set of Baby: Secret Of The Lost Legend. From there, we move on to the supplemental material starting with a Jack Kirby two-page spread that was recently colored by Mike Allred. This is the piece that was used as the cover art for this book and Allred’s coloring work has a legitimately vintage pop feel to it that works wonderfully here. From there, we get a one page Bay-Con 2 pin-up by Gil Kane, inked by Steve Leialoha. It’s a very dramatic piece with McGoohan’s character looking out through bars seeing himself in a car chase. This is technically the one finished page of art that was done for the series – Englehart had Leialoha ink it for him before the convention! 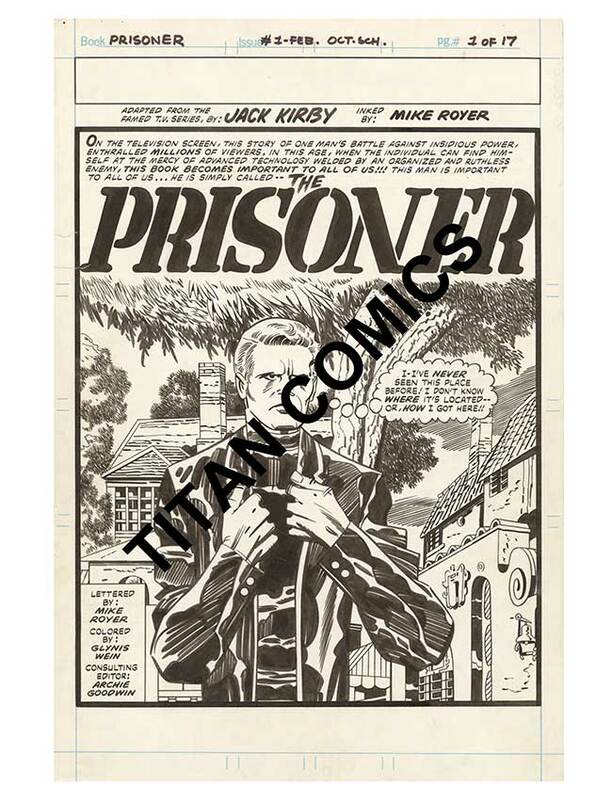 Writing The Prisoner by Steve Englehart is a text piece that gives the property some history, looking back on the shows Secret Agent and Danger Man that paved the way for The Prisoner and then discussing his thoughts on seeing the series for the first time. From there we learn how he came to write the story contained this collection, and how complications with Marvel Comics, who bought the rights to do a comic version, led to neither the Kirby book nor his own book ever being published. This piece is followed by a Steve Englehart biography. 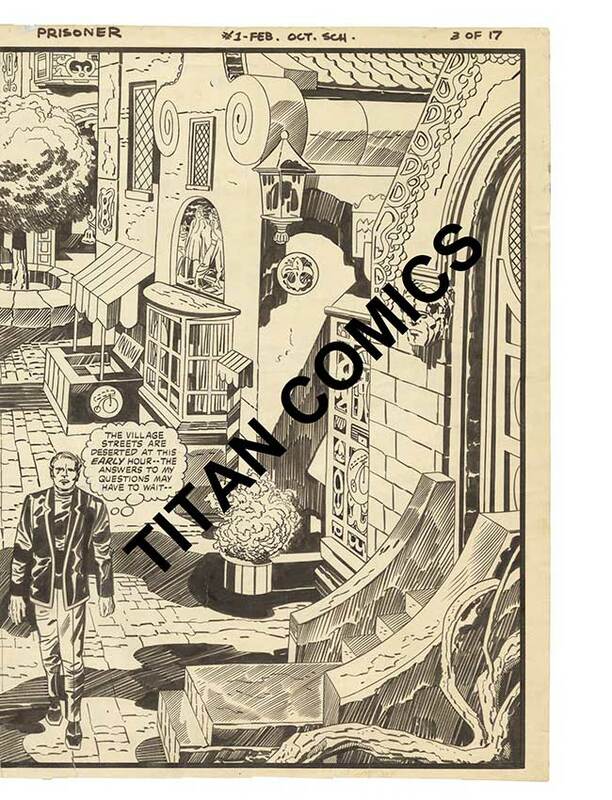 Next up is Gil Kane The Prisoner lettered by Rick Parker wherein Parker has provided proper, print-ready lettering and logo work overtop of Kane’s pencils. 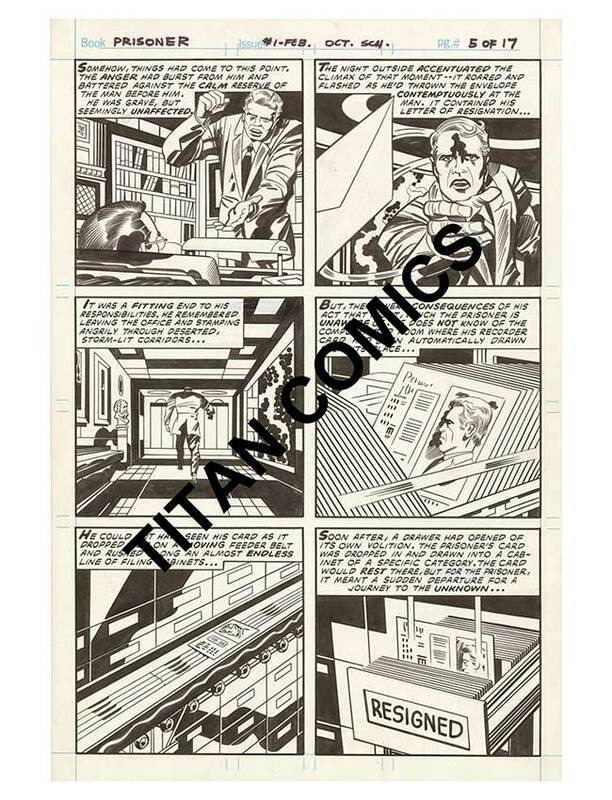 These pages are presented side-by-side with Englehart’s original typed script pages. Each page of the hardcover showcases two pages of art/lettering and two pages of the script so the art isn’t as easy to appreciate as it is in the ‘feature’ version where it’s presented full size, but it’s still an interesting variation worth checking out. The ITC The Prisoner Pressbook section reprints all twenty-seven pages of a vintage pressbook that the network would have handed out to media outlets to generate interest and publicity for the series before it aired. This piece contains info on McGoohan and the cast, the members of the creative team, plot points, the island location and how it all began with a fish! The Story Of The Prisoner by Rick Davy is an essay that runs two pages and contains thoughts on the enduring popularity and legacy of the series, the importance of what McGoohan brought to the show, the location that was chosen to stand in for ‘The Village,’ changes that were made to the original shooting script as the series’ production started in full swing, McGoohan’s car in the film, the ‘weather balloon’ featured in the show and more. It’s an interesting read packed with trivia. Well-written text biographies of Jack Kirby and Gil Kane round out the collection.